The waveshare_epaper display platform allows you to use some E-Paper displays sold by Waveshare with ESPHome. Similar modules sold by other vendors might also work but not have been tested yet. 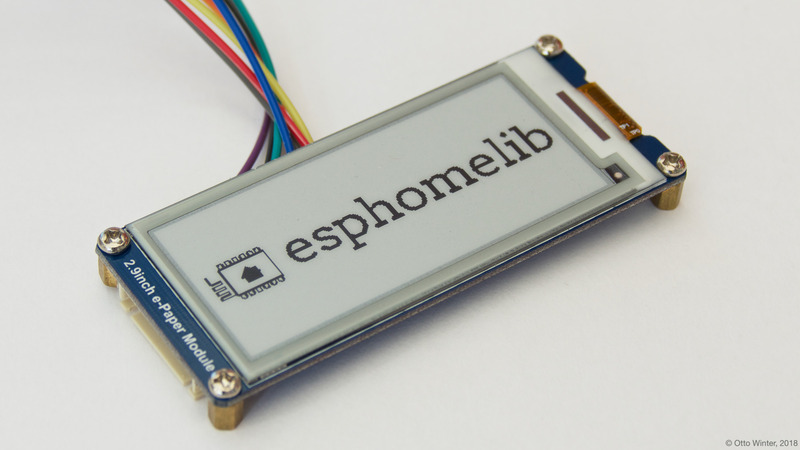 Currently only single-color E-Ink displays are implemented and of those only a few modules. 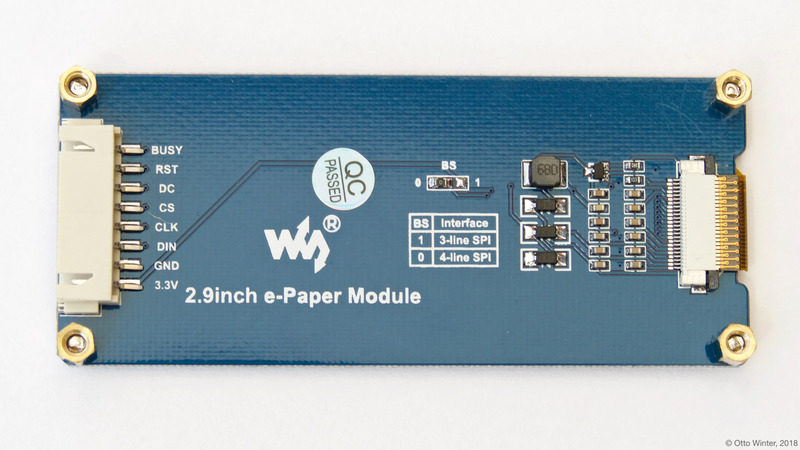 Waveshare E-Paper 2.9 Inch E-Paper Display. The communication ESPHome has chosen to use for this integration is 4-wire SPI, as it’s the most stable and high-speed. So you need to make sure your board is set to the 4-wire SPI mode and have an spi: section in your configuration. cs_pin (Required, Pin Schema): The CS pin. dc_pin (Required, Pin Schema): The DC pin. busy_pin (Optional, Pin Schema): The BUSY pin. Defaults to not connected. reset_pin (Optional, Pin Schema): The RESET pin. Defaults to not connected. Make sure you pull this pin high (by connecting it to 3.3V with a resistor) if not connected to a GPIO pin. rotation (Optional): Set the rotation of the display. Everything you draw in lambda: will be rotated by this option. One of 0° (default), 90°, 180°, 270°. full_update_every (Optional, int): E-Paper displays have two modes of switching to the next image: A partial update that only changes the pixels that have changed and a full update mode that first clears the entire display and then re-draws the image. The former is much quicker and nicer, but every so often a full update needs to happen because artifacts accumulate. On the 1.54in, 2.13in and 2.90in models you have the option to switch only do a full-redraw every x-th time using this option. Defaults to 30 on the described models and a full update for all other models. lambda (Optional, lambda): The lambda to use for rendering the content on the display. See Display Rendering Engine for more information. update_interval (Optional, Time): The interval to re-draw the screen. Defaults to 10s. pages (Optional, list): Show pages instead of a single lambda. See Display Pages.